Image courtesy of Uprising Theatre Company. With The Laramie Cycle, Uprising Theatre solidifies its status as equal to all area stage companies in the production of high quality queer stage work. To mark the 20th anniversary of the sadistic murder of gay college student Matthew Shepard, the troupe has staged what has become the primary drama addressing that horrific event, The Laramie Project. They’re also presenting its lesser known sequel, The Laramie Project: 10 Years Later. For those who have seen earlier productions by other troupes and simulcasts of The Laramie Project and don’t feel the need to see it again, it’s worthwhile to catch The Laramie Project: 10 Years Later. 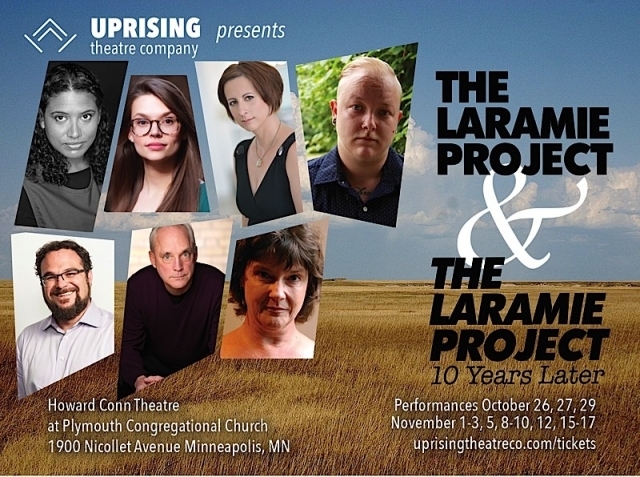 However, if you haven’t seen The Laramie Project, the excellent Uprising troupe offers the opportunity to see both plays run in alternating performances with the same cast. The Laramie Cycle, which refers to both plays, was created from interviews done by members of New York’s Tectonic Theater Project, under the direction of Moises Kaufmann. The members traveled west to Wyoming to interview Laramie citizens for the purpose of shedding light on community attitudes around the crime. The problem with this set up is that, as one might imagine, citizens will surely clam up with these east coasters going to flyover country with judgments in hand. The pieces have that awkward feel to them at certain points, but nonetheless, out of this comes legitimate and unsettling information that Americans should ponder. The Laramie Project: 10 Years Later can be seen on its own whether you’ve seen the first play or not. Though the didactic quality of the Tectonic Collaboration script lends any production to earnestness, Uprising has artfully shaped it into an illuminating theatrical work. The second play of the diptych wrestles with the controversy over just what actually happened when gay college student Matthew Shepard was beaten to a pulp and left to die several hours later. The Tectonics credibly teased out that Shepard’s sexual orientation did in fact make him a target for the savagery inflicted upon him. There’s no doubt about this. Some have proffered a notion that the crime was actually a drug deal gone wrong but there is ample evidence, which this plays puts forth, that homophobia was at the root of the malevolence. Striking distinctions between killers Aaron McKinney and Russell Henderson are made, and polarized views about the crime within the Laramie population are passionately dramatized. The Uprising cast is vividly realistic in playing multiple roles. Seth Matz is especially powerful in portraying both killers. We see clear differences in how each saw the crime and its victim. Co-directors Sarah Catcher and Ashley Hovell have deftly steered the production with other strong heartfelt performances as well: Juliette Aaslestad, Baku Campbell, Bruce Manning, Michael Novak, and Jessica Thompson Passaro. Jake Otto’s lighting and Daniel Mauleon’s projections enhance the play’s documentary style. The cast recreates the original script collaborated on by Kaufmann, Leigh Fondakowski, Greg Pierotti, Andy Paris, and Stephen Belber.